Kaikeyi wanted her son, Bharata, to rule Ayodhya . 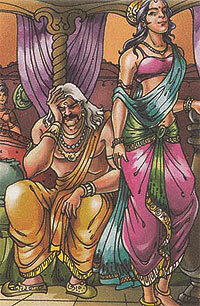 She went to King Dasaratha and reminded him of the two boons that he had once granted her for saving his lif. Dasaratha asked her what she wanted. She asked the king to grant her wishes that Bharata be crowned king of Ayodhya and that Rama be banished to the forest for fourteen years. The King was shocked when he heard this. He had not imagined that Kaikeyi who loved Rama so dearly, could be so cruel. Thus, Kaikeyi became the sole cause for Rama's fourteen year exile to the forests.